**Introducing Tidbit Tuesday. A single-serving story found in the trenches of stay-at-home dading, appearing every other week. Due to job changes I’m now watching our four children for half of the time. This is looking like fertile riffing ground. Let’s begin. Keeping a house clean is a continuous job. Especially when it’s packed with tons of tiny people that hold me responsible for their actions. Whenever I have two free hands I’m washing dishes, loading laundry, or vacuuming because the moment I pause the steady stream of cleaning, it’s all over. Much like bailing rainwater out of a sinking boat, if you stop for a second those kids will downpour you to the bottom of an ocean that only a full weekend of cleaning can pull you out of. And no one should have to spend their weekend doing that. During one of my “free” moments last week I was wiping down the counters when Roman(2) comes around the corner talking gibberish. He starts tugging on both of my back jean pockets needing something. They always need something. I tell him to hold on while I dump my handful of crumbs in the trash, and say a quick prayer about him learning English soon. He then follows me to the trash can still trying to pull a man-beast, seven times his weight, in the opposite direction. This is completely annoying to the man-beast. Once the crumbs find their final resting place I twist around and keep myself from helping Roman find his final resting place. He then reaches into one of my back pockets to retrieve something he’d just dropped in there. I remove his hand and try to fish it out myself, but I can’t. My pocket has been welded shut. I twist further to get both eyes on it. As I peel it apart the gooey, stretchy pink mass reminds me that Charity was the one who wanted kids in the first place. The chewed up gum was firmly anchored to both sides. He must have dropped it in there and then, like a coach sending in a player to make a big play, gave me a “GO GET ’EM!! !” slap on the rear. This was to ensure that the gum adhered to as many square centimeters as possible. Then I think he wanted it back, because he’s two. As I stand there thumbing through my mental archives looking for ideas on how to remove gum from clothes, I see Roman, for whatever reason, is now trying to pour the liquid of a large cup into a much, much smaller one. He fails miserably, spills water all over the floor, and probably doesn’t learn the lesson he should about liquids and volume. Yay for back-to-back messes! Fortunately one is way easier to clean up. This all happened within 45 seconds. 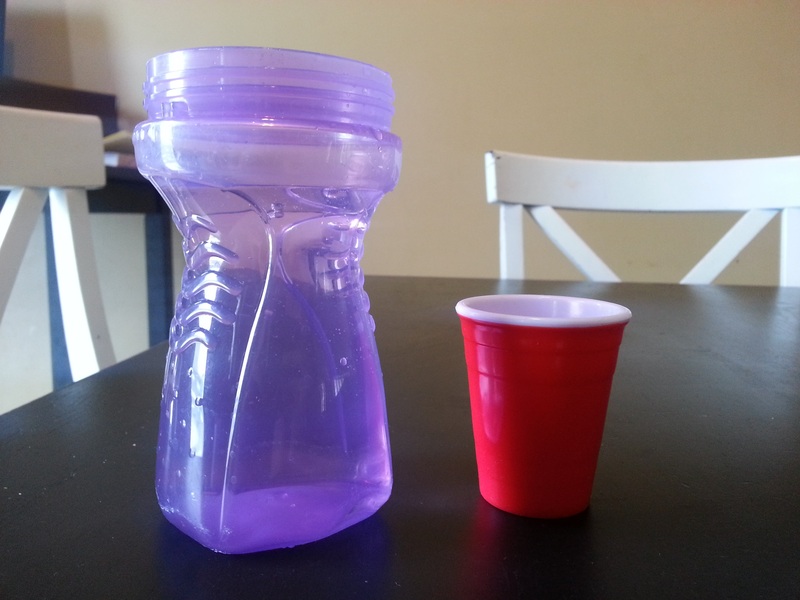 The speed at which he transitioned from one mess to the other had me wondering if the gum incident was actually a diversion for his ultimate diabolical plan of transferring water between cups. This would be like someone robbing a bank so the police won’t notice them loitering shortly thereafter. Nice job son, let’s work on your villainy though. 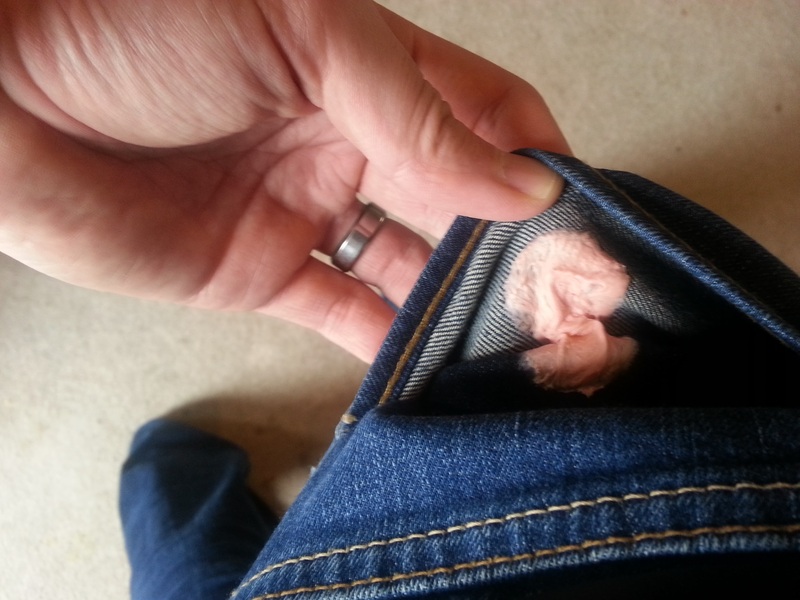 I ended up putting my jeans in the freezer, then scraping off the hardened gum, and hitting it with Goo Gone. I also considered walking around in my underwear all day to teach everyone a lesson about giving their two-year-old brother gum. I didn’t do it though. I think the threat of it was enough. I am so jazzed about Tidbit Tuesday! And, brilliant move on the jeans-in-the-freezer. We do not want to know if you walked around in your underwear while they were freezing. I am so so so glad I was not drinking anything when I reached your final paragraph. Sputter cough gag ROTFL. It is so hard to explain why being an at-home parent is exhausting and nonstop that sometimes I can’t actually even remember myself how nonstop and exhausting it is. Thanks for reminding me. I’m going to stop by Tidbit Tuesday every time I get a little verklemped at the sight of a baby boy and wish mine were still little. Makes me thankful for teenagers that while they bitterly fight with each other most waking moments, can not only clean their own messes but cook their own breakfast when I can’t be there. And yay for weekly tidbits!